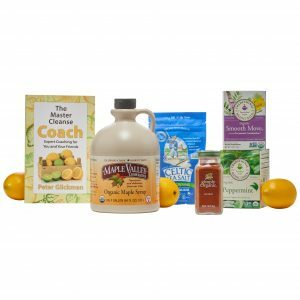 The Master Cleanse consists of a strict daily regimen of a morning salt water flush, six to twelve 10-ounce glasses of Master Cleanse lemonade mixture, and a nightly elimination tea. During the fast, the calories and nutrients you usually get from food are replaced by those from the specially prepared lemonade, which must be taken a minimum of 6 times a day. As many glasses of lemonade as desired may be taken beyond the minimum required. Peppermint tea can be taken on occasion, and water can be taken as desired. Following the daily regimen strictly for a minimum of 10 days will give the best results. Burroughs emphasizes that the master cleanse eliminates toxins from the body, and he suggests helping the body along with herbal elimination teas and salt-water cleansing. • Add 2 level teaspoons of non-iodized sea salt to a full quart of lukewarm water. Drink the entire quart of salt and water first thing in the morning. NOTE: This must be taken on an empty stomach. Several eliminations will likely occur during the next hour. If elimination does not occur, increase the amount of salt slightly; if it is too forceful, reduce the salt-to-water ratio until the proper balance is found. 2. Drink 6 or more glasses of the Master Cleanse organic lemonade mixture throughout the day. In the past, it was recommended to use less maple syrup – as little as 1 TBSP per 10 oz glass – to maximize weight loss on the lemonade cleanse. However, using more maple syrup provides sustaining energy that allows many individuals to maintain the cleanse. Thus, one may be more likely to meet weight loss goals using the same lemonade recipe that is recommended for detoxification, including 2 TBSP of maple syrup per glass. 4. End each day with a cup of Smooth Move® or other senna-based tea. “Easing in” to the master cleanse gives your body a chance to prepare for the fast. Most experts suggest a period of four to five days before you begin the actual lemonade diet. The following suggestions are intended to “ease” your body into the fast. On the first day of easing in, begin to develop more awareness about the foods you choose and notice which are fresh and raw. Begin to focus on these types of food and eliminate all processed foods, meat, dairy, alcohol, caffeine, and sugar. Choose organic whole foods. On Day 2, completely eliminate all processed foods, meat, dairy, alcohol, caffeine and processed sugars from your meals. Instead, opt for fresh, organic fruits and fresh, organic vegetables. Eat as much of your food raw as possible. Continue reading The Master Cleanser. Switch to a liquid diet to prepare your body and mind for the days ahead. If you have a juicer or blender, then make fresh vegetable and fruit smoothies and juices from organic produce. You can also make light vegetable soups and broths for this day. In The Master Cleanser, author Stanley Burroughs cautions readers to break their fast with a day of consuming only orange juice. Use this same strategy for the last day of the easing in period. Drink several glasses of fresh-squeezed, organic orange juice during the day. If you feel hungry, you can add a tablespoon or two of maple syrup to the juice. Also, drink plenty of water. At night, in preparation for starting the lemonade diet, take the laxative tea. Now your body is more prepared for the cleanse! Drink several 8oz glasses of fresh-squeezed organic orange juice during the day – with extra water if needed. Some time during the afternoon, prepare an organic vegetable soup (no canned soup) as described below. Make enough for 2 meals. Have the soup for the evening meal using the broth mostly, although some of the vegetables may be eaten. Organic whole grain rye wafers may be eaten sparingly with the soup, but no bread or crackers. Store the remaining soup in the refrigerator. Use several kinds of organic vegetables: potato, celery, carrot, greens, onion, okra, tomato, squash, zucchini, green peppers. Use one or two kinds of organic legumes: beans, split peas, lentils. Organic dehydrated vegetables or organic vegetable powder may be added for extra flavor. Organic brown rice may be added. Do not add any meat or meat stock. Use sea salt delicately as a limited amount of salt is necessary. The less cooking the better. Learn to enjoy the natural flavor of the vegetables. Drink fresh-squeezed organic orange juice in the morning. At noon have some more of the organic vegetable soup. For the evening meal have whatever is desired in the form of organic vegetables, salads or fruit only. Do not eat meat, fish, eggs, bread, pastries, caffeinated tea or coffee, alcohol, sugar or milk. Many people desire to change their eating habits, but have difficulty doing so. The Master Cleanse gives you an opportunity to make a change in your diet by giving you a break from your normal habits. Stanley Burroughs emphasizes that in order to obtain lasting benefits from the Master Cleanse Lemonade Diet, following the cleanse a healthful diet should be maintained. Should I stop taking my medications while doing the Master Cleanse? Prescription medications should not be stopped during the Master Cleanse unless approved by the doctor who prescribed the medication or another qualified physician. Stanley Burroughs does recommend that over-the-counter vitamins and supplements be stopped during the Master Cleanse. What else can I eat on the Master Cleanse? The long answer is (also) NOTHING. However, you may drink as much of the Master Cleanse lemonade drink as you want and also organic peppermint tea. Following the Master Cleanse lemonade regimen strictly for at least 10 days is what will give you the best results. That’s everything you need except fresh lemons (or limes) and water. Note: It is strongly recommended to read a guide book before starting the Master Cleanse regimen. 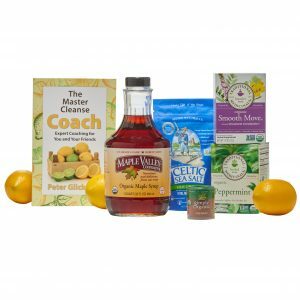 Our most popular Master Cleanse Kit! 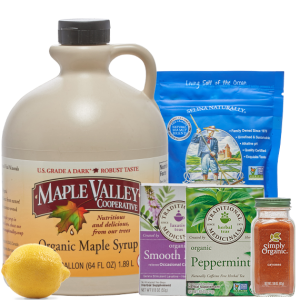 That’s everything you need for the Master Cleanse except fresh organic lemons or limes and purified/filtered water. The statements on this website have not been evaluated by the Food and Drug Administration (FDA). Nothing on this website should be considered as health or medical advice. The information and products offered on this website are not intended to treat, cure, or prevent any disease or condition. Always consult with a doctor or trusted health professional before following any dietary, nutritional, or herbal recommendations. 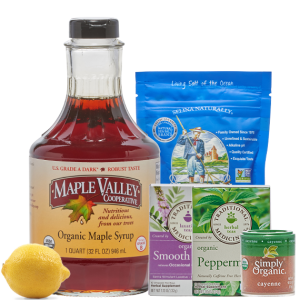 Maple Valley is a producer of organic maple syrup and does not manufacture Master Cleanse products. 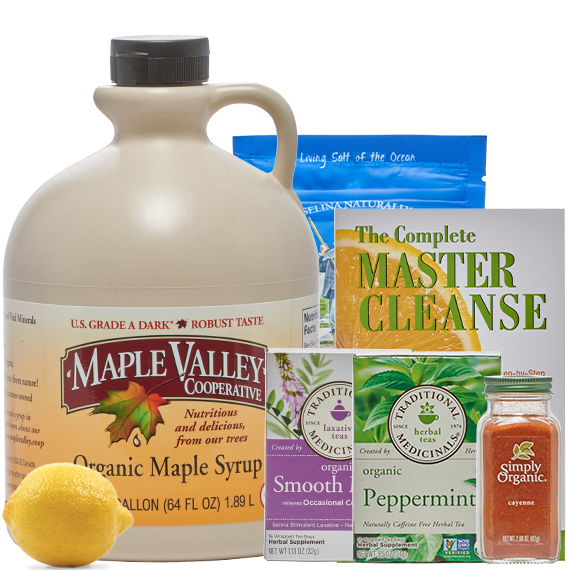 We provide the ingredients for the Master Cleanse solely for the convenience of our customers. The content on this website is provided solely for educational purposes; anyone who follows it does so voluntarily. Each individual must use their own judgment as to a product’s use. Maple Valley Cooperative cannot assume any responsibility for the information or products on this website and cannot take any responsibility for adverse reactions. The information taken from this website and acted upon by the reader or other interested parties is carried out at that individual’s own personal risk.